The Ursids meteor shower is usually a minor shower with ZHR < 10 which has produced outburst in 1945, 1982 and 1986. As this is a very poorly-observed shower, other similar events could easily have been missed due to poor weather or too few observers active. It was discovered during the outburst of 1945 even if a first mention of this shower is found on a 1914 paper by Denning. 8P/Tuttle is the parent comet. A couple of months ago we started to work on an automatic meteor detection system to be installed in Castellammare di Stabia, Italy. 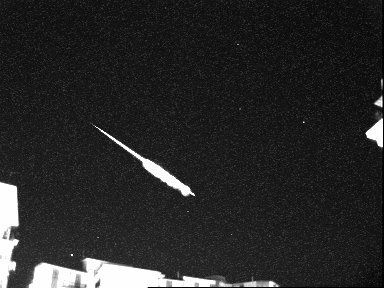 A special camera is linked to a software for the automatic detection of video meteors. More details about the setup in a next post. While ground pictures of the fireball are still missing (the event occurred in a remote area over northern Sudan), it looks like finally there is an image of the impact flash. 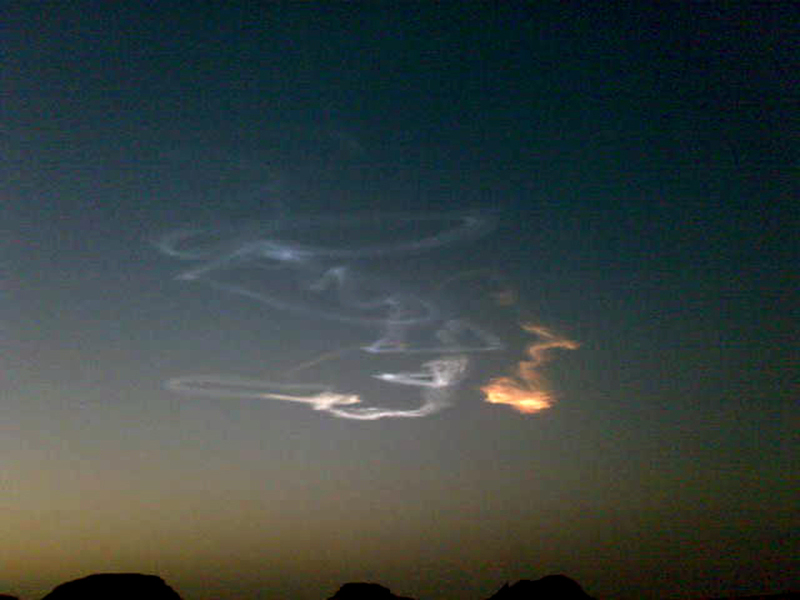 The explosion was imaged by the weather satellite Meteosat 8. According to J. Borovicka, Astronomical Institute, Czech Academy of Sciences, the bright spot on the images taken by the weather satellite Meteosat 8 has been noticed by Z. Charvat. This bright spot likely corresponds to the atmospheric entry of 2008 TC_3 over northern Sudan (see - IAU Circular No. 8994). 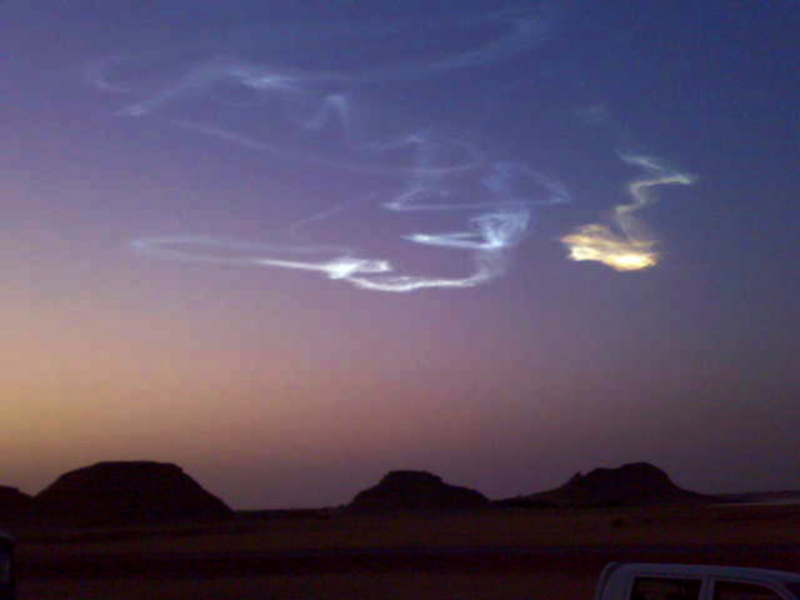 Roughly one hour before expected atmospheric impact over northern Sudan, 2008 TC3 entered Earth' shadow becoming invisible until the impact. Animation showing the motion of small asteroid 2008 TC3 few hours before entering Earth atmosphere. 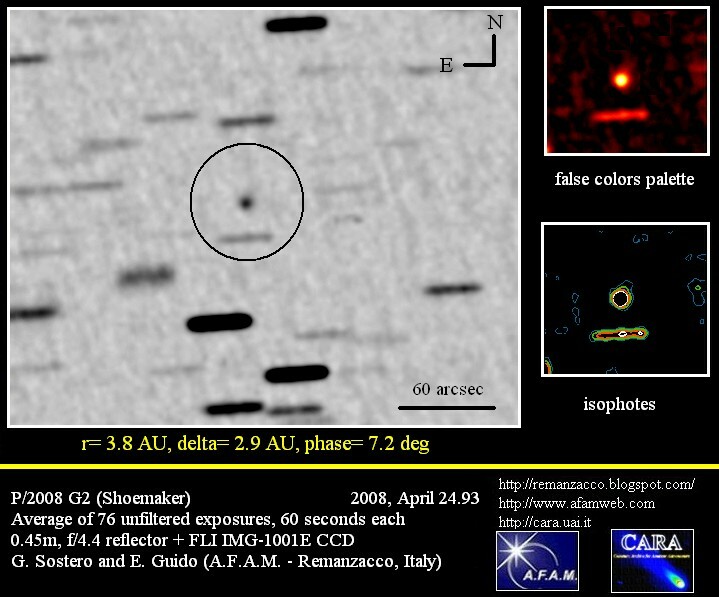 Images obtained at Remanzacco Observatory by G. Sostero, E. Guido & P. Camilleri. 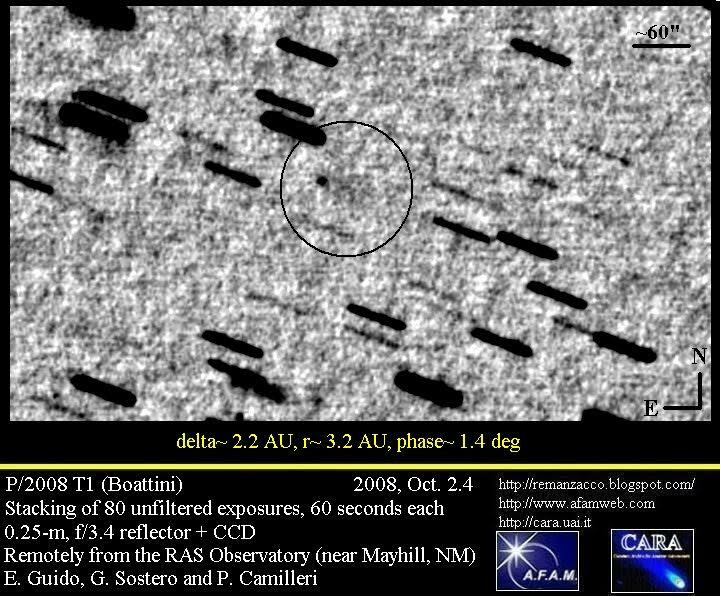 On the morning of 06 October 2008, astronomer R. Kowalsky of Mount Lemmon Survey detected a small object (absolute magnitude H=30.4) now designated 2008 TC3. According to NeoDys and Jpl Neo experts, the impact with the Earth atmosfere is almost certain and it should be at 0246 UTC of 07 October 2008. Fortunately this object is only a small chunk of rock few meters in size and should not survive passage through the atmosphere. In case some fragments should reach the ground, the impact zone has been located in the northern Sudan. The entry in the atmosphere should be visible over northern Africa and possibly even over southern Europe. 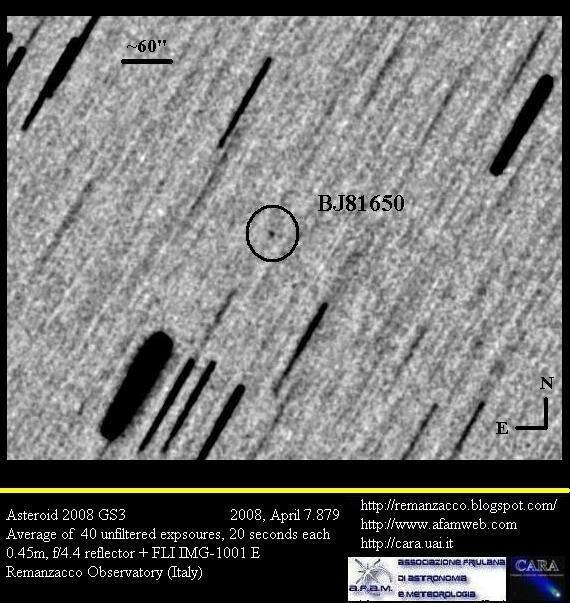 Almost certainly 2008 TC3 will be the first impacting object discovered before entry into the Earth's atmosphere. IAUC nr. 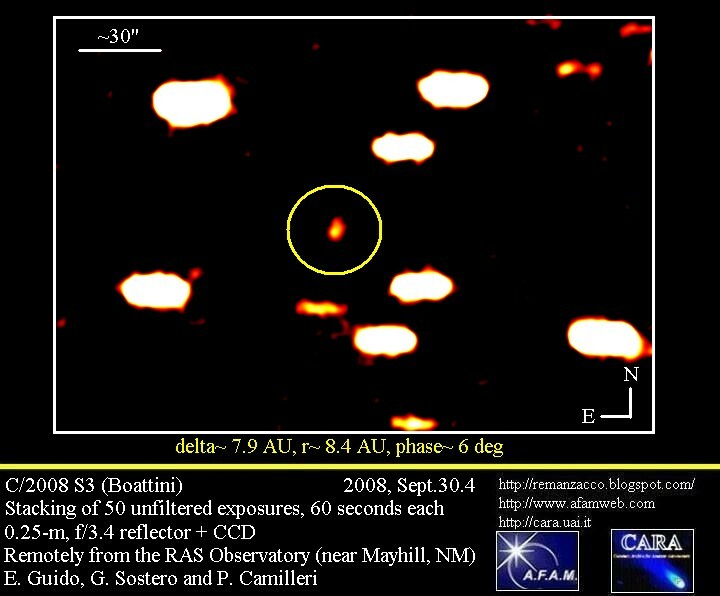 8988, published on 2008, Oct. 2, announces the discovery of another comet (his fifth) by Andrea Boattini, named P/2008 T1 (BOATTINI). 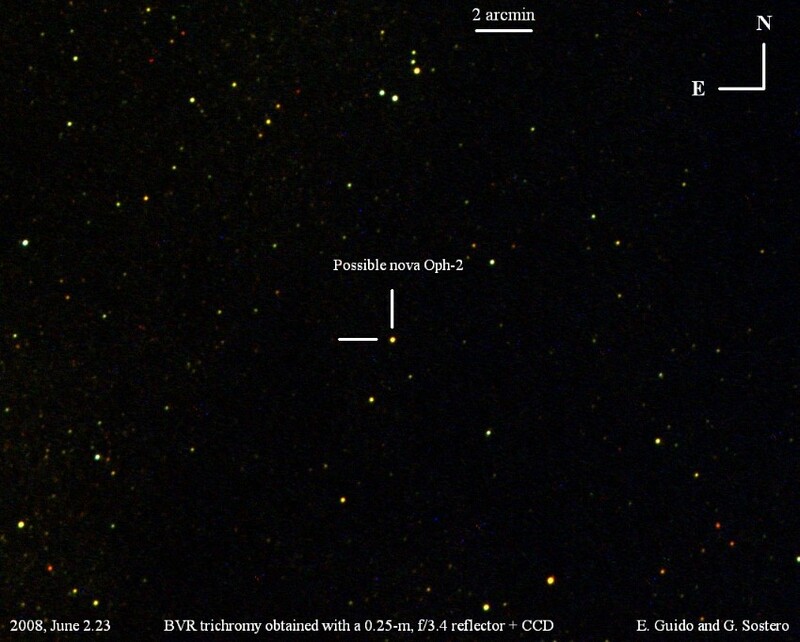 This 18.th magnitude object has been found in Pisces, during the Catalina Sky Survey search, with a 1.5-m reflector. The discoverer reported a fairly condesed coma about 10-arcsec in diameter, and a fan-shaped tail nearly 1 arcmin long, in PA ranging 245-275 deg. After its posting on the Minor Planet Center's NEO-Confirmation Page, several observers confirmed its cometary nature, remarking the presence of the above mentioned broad fan tail toward West-Southwest. We confirmed it remotely from Mayhill (NM) through a 0.25-m, f/3.4 reflector + CCD around October 2.4. 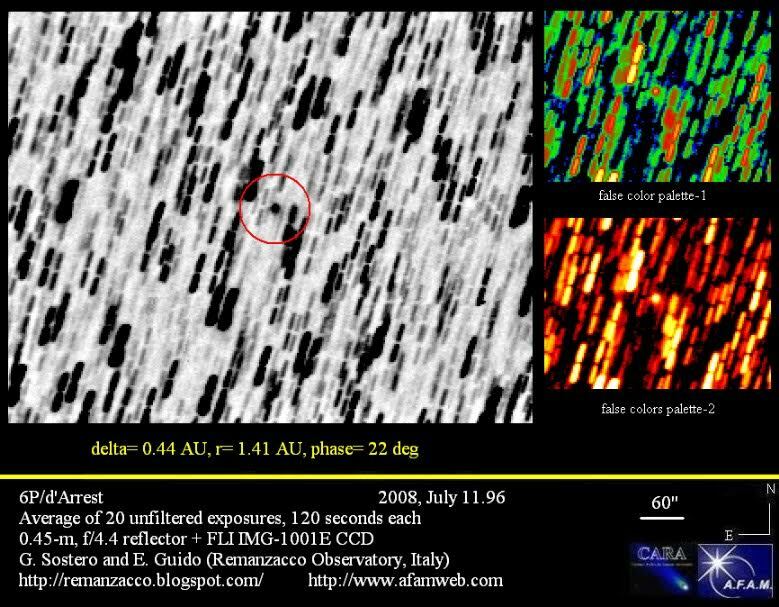 Eighty stacked 60-s unfiltered CCD exposures show a coma about 10" in diameter and a broad, fan-shaped tail about 40" toward p.a. 244 deg. Click on the image below for a bigger version. 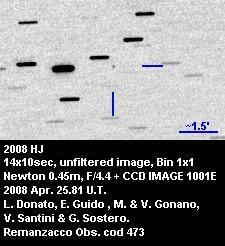 provides a solution that points toward a "Jupiter family" object, with perihelion on February 2008 (e=0.29, q~ 3.02 AU, i~ 2.1 deg). 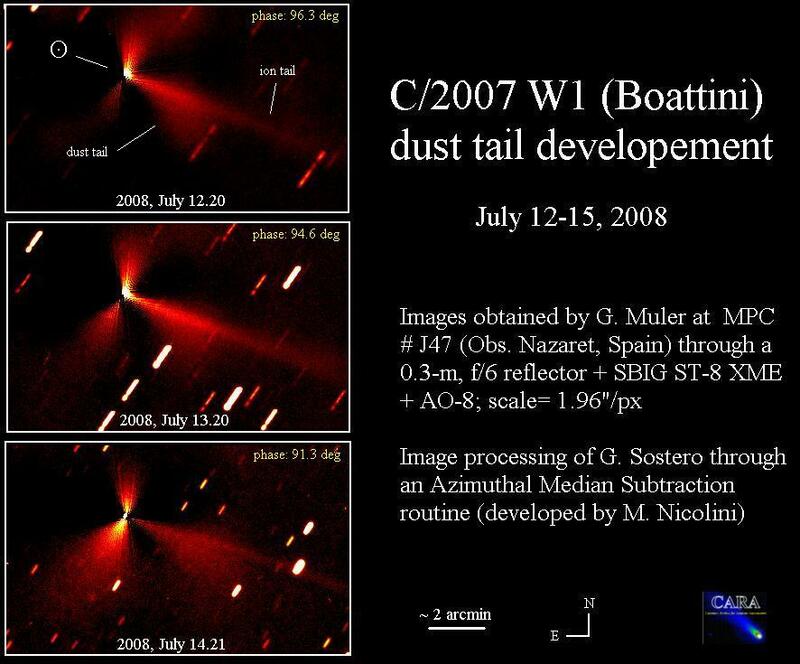 Under these circumstances, it appears that this comet has experienced a close encounter with Jupiter around June 2002. In the next future, P/2008 T1 will gradually decrease its brightness, staying not far from the ecliptic for several months to came. IAUC nr. 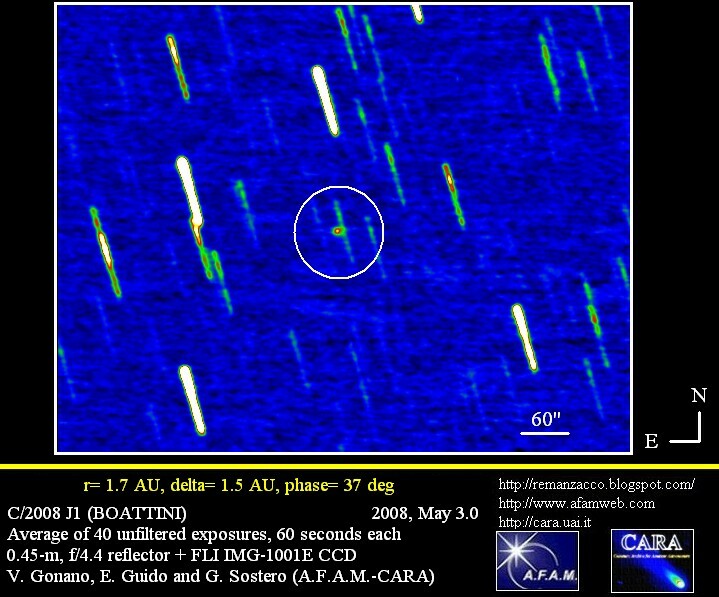 8986, published on 2008, Sept.30, announces the discovery of a comet by Andrea Boattini, named C/2008 S3 (BOATTINI). 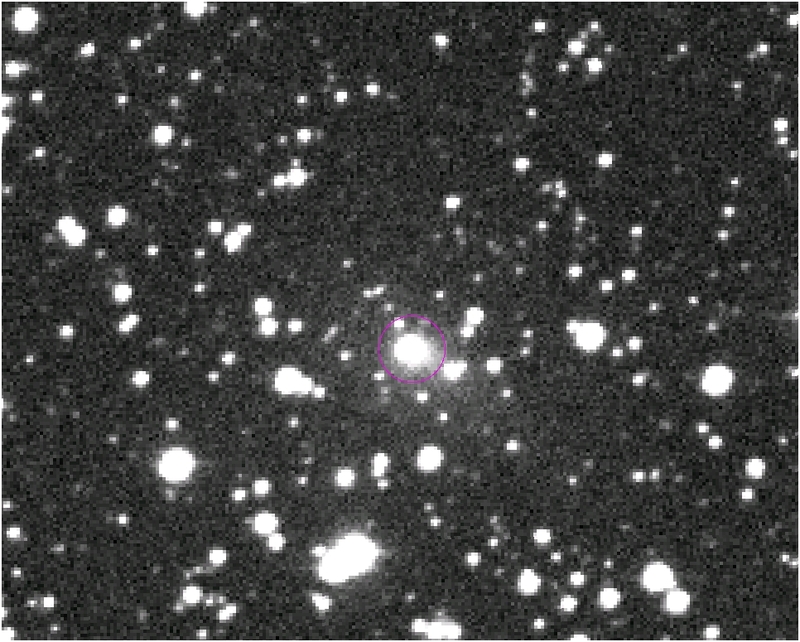 It has been found in Taurus, during the Catalina Sky Survey search, with a 1.5-m reflector. The discoverer reported a coma having a strong condensation and a coma about 10-arcsec in diameter, elongated toward PA 115-deg, with total magnitude about 18.5. 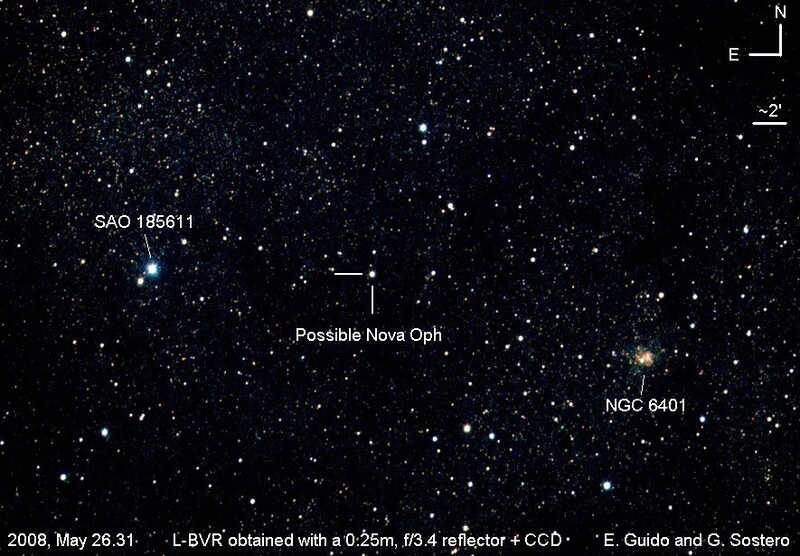 After its posting on the Minor Planet Center's NEO-Confirmation Page, several observers confirmed its cometary nature. Preliminary orbital elements published by the Minor Planet Center on M.P.E.C. 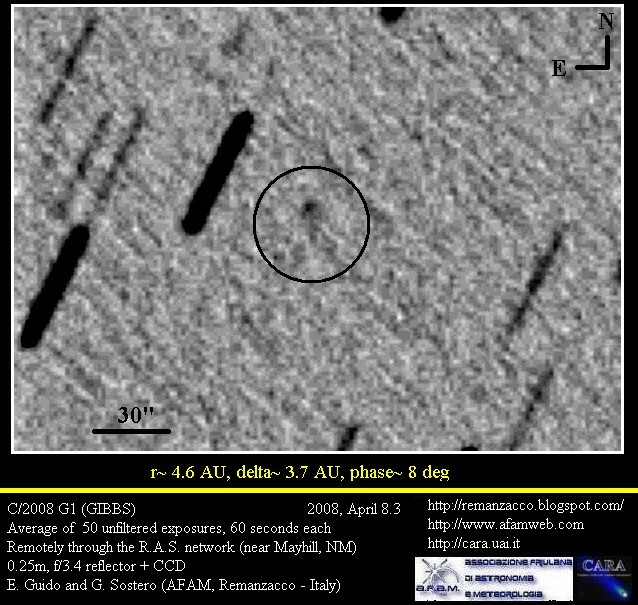 2008-S96 assume a parabolic retrograde orbit with perihelion on April 2011 (e=1, q~ 3.1 AU, i~ 158 deg). It's noteworthy the fact that the comet has been discovered to be active at about 8.3 AU from the Sun; this seems to indicate a rather "alive" object also at relatively high distances from our star. Maxim brightness is supposed to be reached in the Summer of 2011, at about magnitude 12 (well placed in the sky for both hemispheres); obviously all the previous extrapolations are based on measurements conducted upon a very short arc of orbit, so they must be confirmed by further astrometric and photometric follow-up. The asteroid 2008 QS11 has been discovered by the Siding Spring sky Survey (MPC code #E12) on 27 August 2008 at about magnitude 18. The absolute magnitude of 19.8 suggests a diameter within a factor of two of 350 m (1). Due to its size and the proximity of its orbit to Earth's, this object has been classified as a "Potentially Hazardous Asteroid" by the Minor Planet Center. This object is also a target for the Goldstone Radar facility. 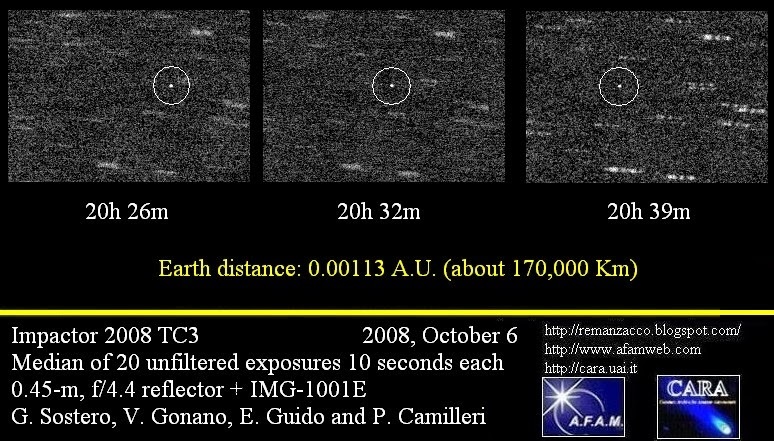 2008 QS11 (classified as an Apollo-type NEO) will reach on 02 October 2008 the minimum distance from Earth (0.02767 A.U.) with a maximum predicted brightness of about magnitude 14. Range increases down and Doppler frequency increases to the right. The bandwidth is about 1 Hz and the visible extent is roughly 280 meters. Given that the radar can illuminate only about 1/2 of the object, its true size is thus about 560 meters. 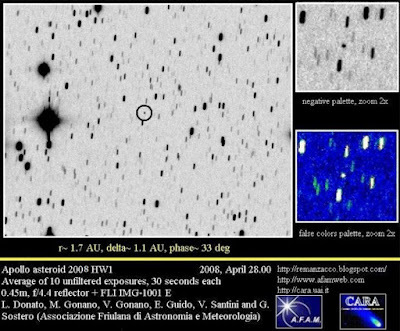 This periodic comet, 59P/Kearns–Kwee, has been recovered by us, on 2008, July 28 & 29, during the Visnjan School of Astronomy, an educational project aimed at the introduction of young talented students into the field of astronomy, organized every year by the Visnjan Observatory . 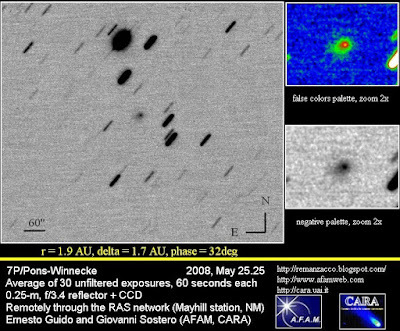 Two consecutive nights of follow up, as recommended by the Minor Planet Center, has been secured by means of the remotely controlled Skylive-4 telescope (0-30m, f/6.3 reflector + CCD) located in Catania, Italy (B40 – Skylive Observatory, Catania). 59P has been picked-up in the morning sky in Aries, significantly fainter than predicted (about magnitude 19) but very close to the expected position. In our stackings it appears as a faint dot of light, slightly wider than the nearby field stars of similar brightness. At recovery the comet was located about 2.8 AU from both, Earth and Sun. According to the Minor Planet Center, the last time of its observation was 2000, March 9 (Kuma Kogen Observatory). 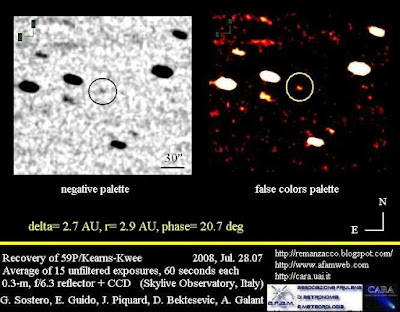 Comet Kearns-Kwee belongs to the Jupiter family comets; its period is nearly 9.5 years; at perihelion (March 2009) it will get as close as 2.3 AU from our star (beyond the orbit of Mars) while at aphelion it reaches 6.6 AU from the Sun (beyond Jupiter). According to the current ephemerids, comet Kearns-Kwee will reach its maximum brightness at perigee, on November 2008: at that time it will shine at about magnitude 14, very well located (for northern observers) in the autumn constellation of Triangulum. Updated orbital elements and ephemerids are available, as always, at the Minor Planet Center website. This detail appeas as a broad fan-like structure, nearly 3 arcmin long, extending toward South-West; it almost overlap the long and narrow ion tail that has been observed since before perihelion. The dust tail becames readily visible after a simple Azimuthal Median Subtraction routine, that enhances any deviation from a "normalized" profile of the coma. Probably it was present also in our previous shots of the comet, however its visibility was strongly hampered because of the poor observing conditions (comet very low in the sky in the morning twilight). Currently the solar elongation of C/2007 W1 is increasing, so we expect that this detail will be soon picked-up by a number of other observers, without any particular image-processing routine. Observers with CCDs are encouraged to follow-up its development, possibly using some red or infrared filters, in order to reduce the contribution of the gas coma and the ion tail. 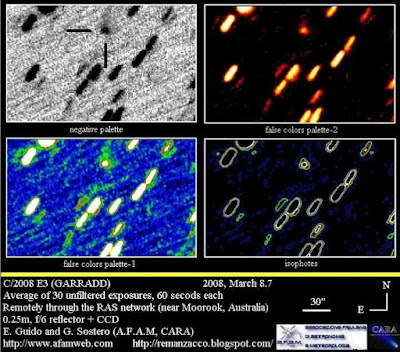 Image processing show the possible presence of a tiny coma, nearly 20 arcsec in diameter. 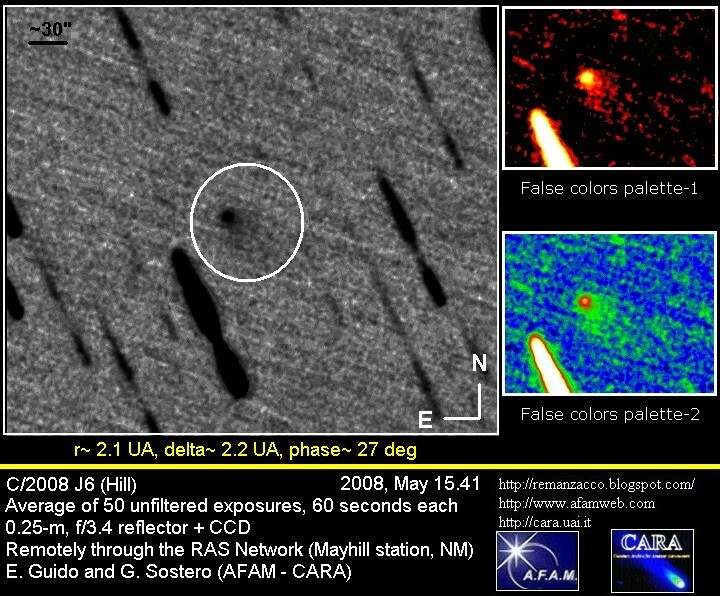 The crowded stellar field hampers a sure identification of this feature, however this faint "halo" moves with the proper motion of the comet; moreover, the FWHM of the comet appears to be significantly larger compared to that of neary field stars of similar brightness, and this seems to confirm the presence of a detectable coma. The brightness of the comet has been measured at about magnitude 15 (Ru). This is still somehow fainter compared to the ephemerides (that indicates instead a visual total magnitude m1 equal to about magnitude 14), however we do know that i) CCDs magnitudes are frequently fainter than visual magnitudes and ii) the lightcurve of 6P/d'Arrest is known to show a striking asymmetric lightcurve, with lower pre-perihelion brightness. 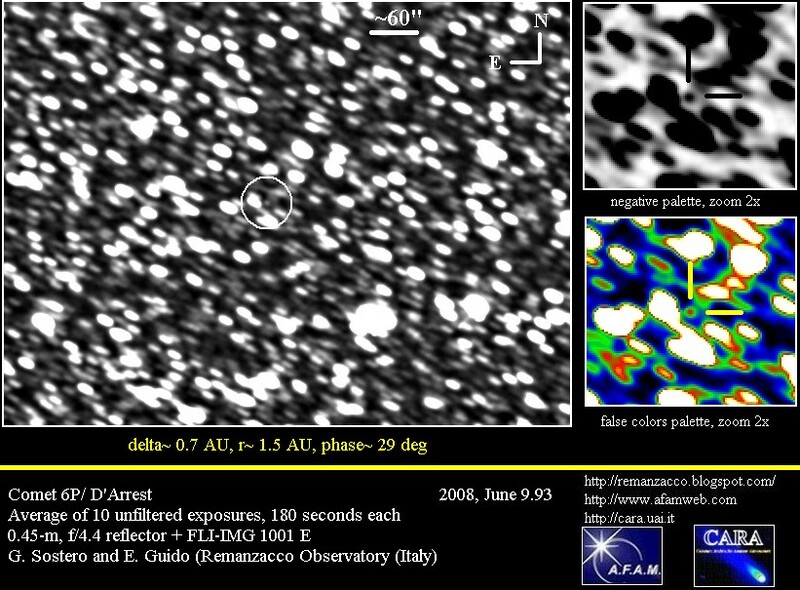 The Afrho parameter is still rather low (about 16-cm for a radius of nearly 3,000 Km at the comet distance). Updated ephemerides are available (as always) at the Minor Planet Center website. 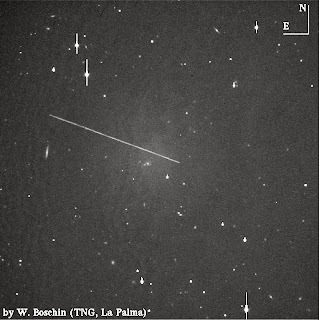 On 2008, July 3.03 we performed some follow-up of C/2007 N3 (Lulin), through the 0.3-m, f/6.9 reflector + SBIG St8 XME CCD of one of us (Gustavo Muler, Observatorio Nazaret, Lanzarote, Spain), while the comet was moving in Capricornus. Geometrical circumstances at the moment of the observation: airmass: 1.52, T-152 days, delta~ 2.0 AU, r~ 2.9 AU and phase angle~ 10 deg. Comet Lulin show a nearly circular coma, about 30 arcsec in diameter, slightly elongated toward North-West. 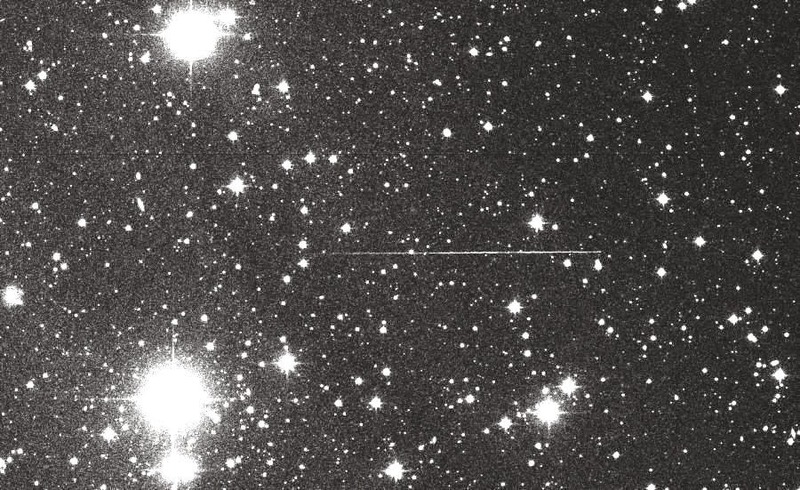 Photometrically the coma show a very uniform profile, a kind of "disk", of nearly uniform brightness; just the outermost ~ 5 or 10 arcsec being very faint compared to the central part. 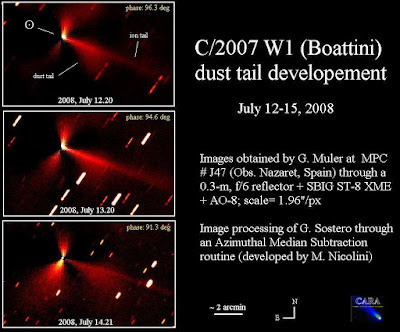 This outlooking reminds somehow the aspect of 17P/Holmes shortly after its 2007 outburst (however this doesn't mean necessarily that these two comets share the same behaviour: it's just a morphological evidence!). show clearly the unusual photometric morphology of the coma. The total magnitude turned out to be Ru~ 12,7. Since we operated unfiltered, in our case the afrho parameter (proxy of the dust abundance within the coma) determination has just to be considered an upper limit; anyway it turned out to be a fairly high value, close to ~ 1,500 cm. We acknowledge the use of the C.A.R.A. algorithms for the image processing (developed by Martino Nicolini) and the afrho calculations (develped by Roberto Trabatti). 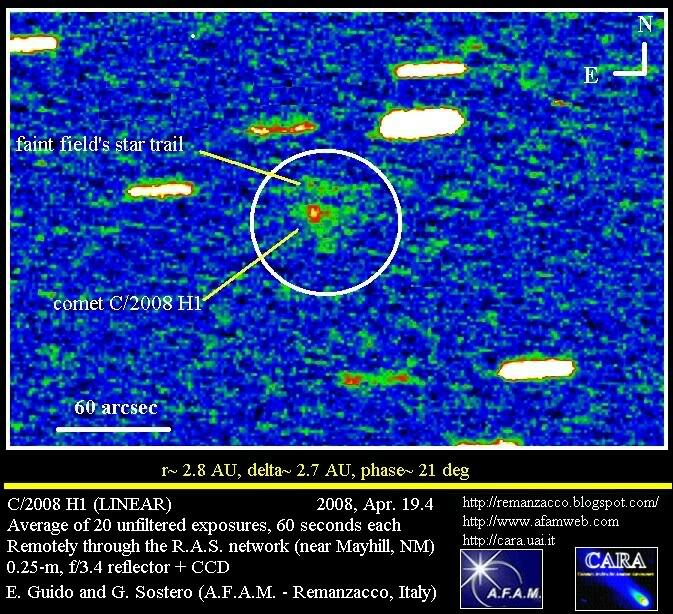 IAU Circular nr.8953, issued on 2008, June 15, announces the discovery by R. E. Hill of a new comet, named C/2008 L2 (HILL). 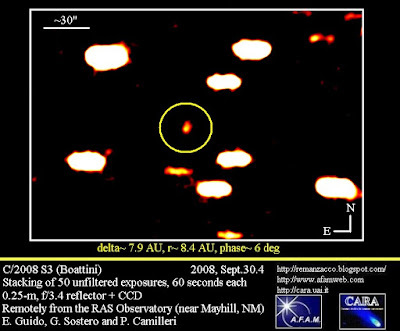 It was found with the 0.68-m schmidt of the "Catalina Sky Survey" on 2008, June 12.44, in the morning sky within Pegasus, and it has been described by the discoverer as having a coma diameter of 5"-14" with a diffuse, fan-shaped tail about 20 arcsec long in PA 250 degrees. 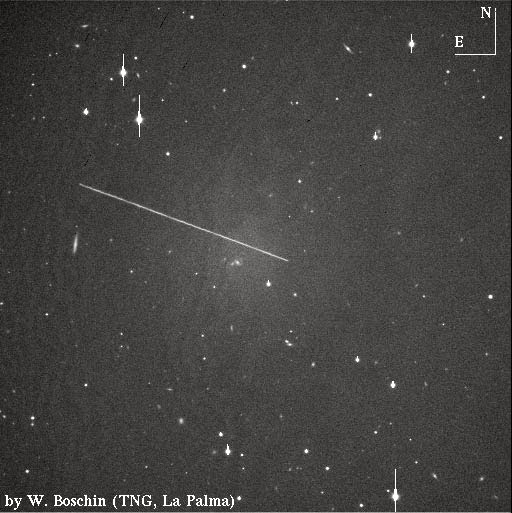 After posting on the Minor Planet Center's 'NEOCP' webpage, J. M. Aymani (Tiana, Spain) observing with a 0.25-m reflector + CCD, reported the dtection of a faint tail in PA 256 degrees. 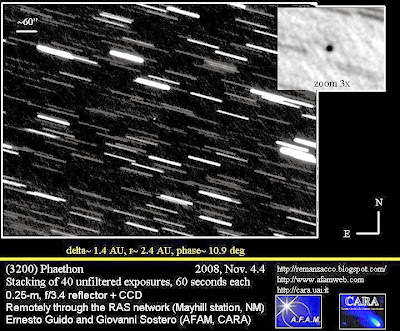 We observed it remotely from Mayhill (NM) on 2008 Jun. 13.4, through a 0.25-m, f/3.4 reflector + CCD of the "Global Rent A Scope" network: in our stacking (co-adding of 42 unfiltered exposures, 60 seconds each) we could only appreciate that this object appeared slightly "soft" compared to nearby field stars of similar brightness. Preliminary orbital elements published by the Minor Planet Center in M.P.E.C. 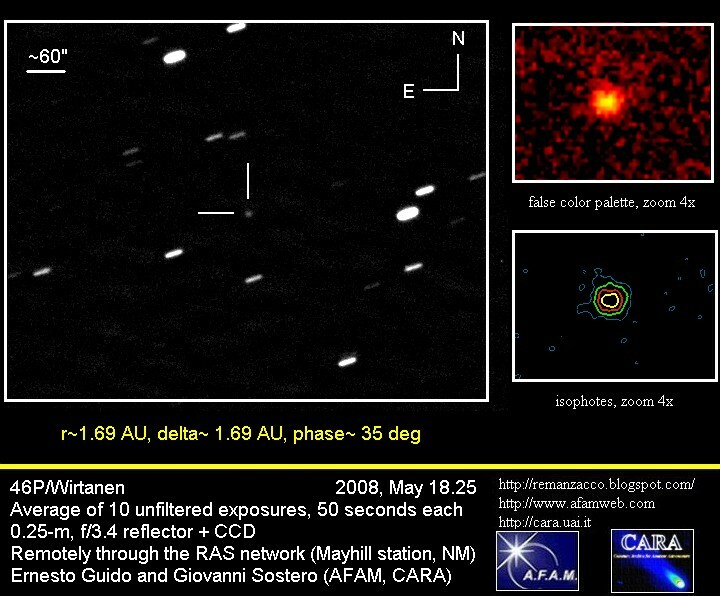 2008-L55 (http://tinyurl.com/5mtx5n) assumes that this object moves along a parabolic orbit (i= 25 deg, q= 2.5 AU); perihelion will be reached at the end of July 2008. According the current ephemerids, this comet will reach its maximum brightness next September (m1~ 17.2). In our stackings it appears as a faint smudge of light (magnitude nearly 18). No coma or tail can be appreciated in our images, however it must be said that when we imaged it, the comet was merely 20 degrees above the horizon, nearly lost in the morning twilight, so we cannot exclude that under better observing conditions further details could be glimpsed. 61P belongs to the "Jupiter family comets" class, it completes its elliptic orbit (a~ 3.7 AU, e~ 0.43, i~ 6 deg) every 7 years. It will reach perihelion at the beginning of September 2008; however, it is not supposed to get significantly brighter than magnitude 15 (this maximum in its lightcurve will be reached at perigee, around the end of October 2008). 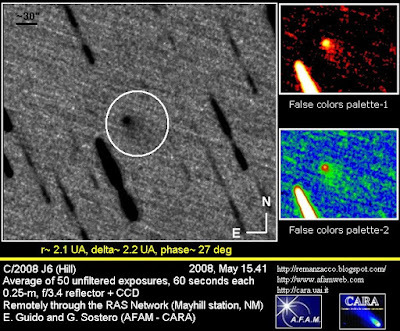 This comet has been recovered during its current return to perhelion by J. Hobart (Kachina Observatory) on 2008 Apr. 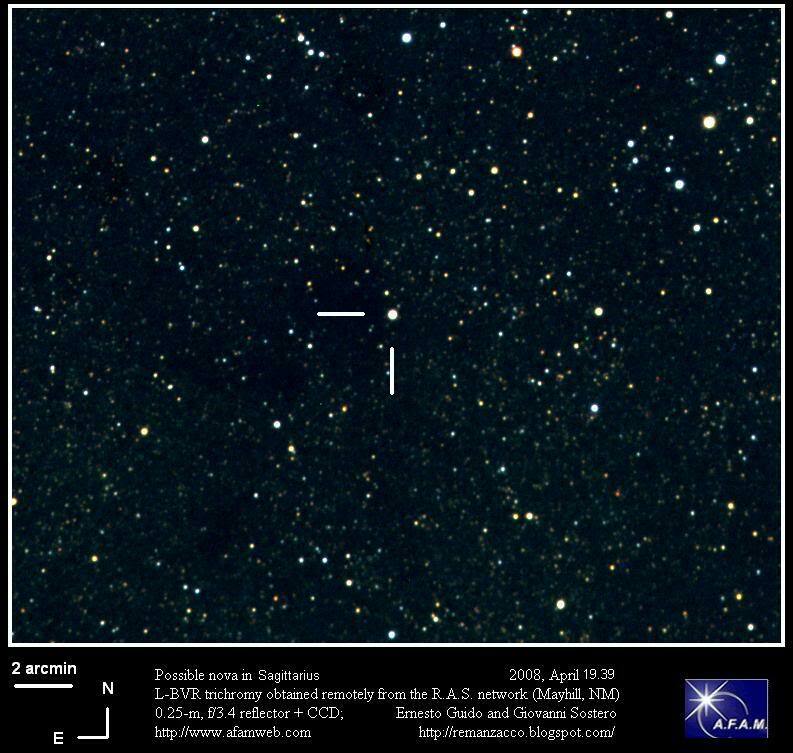 29.37, through a 0.36-m f/11.2 Schmidt-Cassegrain + CCD, while it was slowly moving in Ophiucus at m2~ 19.5. It is supposed to became a relatively easy telescopic object in a few months from now; perihelion will be reached on 2008, August 14, while perigee will occour few days earlier). 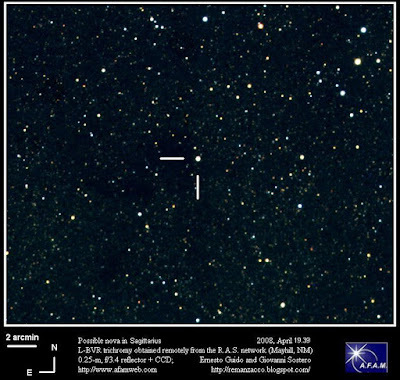 In our stackings it appears as a faint starlike object (red magnitude close to 18) while it moves in a very rich Milky Way's star field in Aquila. Due to the star crowding, it is nearly impossible to distinguish any potential weak coma, if present. Following the posting on the Central Bureau's unconfirmed-objects webpage about another possible nova in Ophiucus, today we performed some follow-up of this object remotely through a 0.25-m, f/3.4 reflector + CCD, near Mayhill (NM). R.A. = 17h33m29s.62, Decl. = -27o 01'14".5 (equinox 2000.0; UCAC-2 catalogue reference stars). Our multicolor photometry provides the following values: 2008, Jun. 2.23, B= +13.9, V= +12.8, R= +11.4 (accuracy +/- 0.1 magnitudes in each color). Comparison with a UK Schmidt Telescope red plate, obtained on 1991, August 11 show nothing in this position (limiting magnitude near 20). See below our confirmation image (details are on the caption; click on it for a bigger version). M.P.E.C. 2008-H35, issued on 2008 Apr. 28, 18:44 UT, announces the discovery of 2008 HW1, an Apollo asteroid in a very comet-like orbit (Tj nearly 2.4; Jupiter family comets have Tisserand parameter TJ between 2 and 3). It was picked-up by the staff of Lincoln Laboratory ETS through a 1.0-m f/2.15 reflector + CCD, on 2008 April 25.35091. After its posting on the NEO Confirmation Page, further follow-up was secured by a number of observers. According the preliminary orbital elements published by the Minor Planet Center, 2008_HW1 moves along a very elongated orbit (e~0.96), that takes a little more than 4 years to be completed; at aphelion it approaches the orbit of Jupiter (Q~ 5 AU), while at perihelion (that will be reached in middle of next June) is passes only 0.1 AU - or nearly 15 Million Km - from the Sun. This is a rock whose diameter is supposed to range from nearly 600-m to 2-Km (depending on its surface reflectivity). 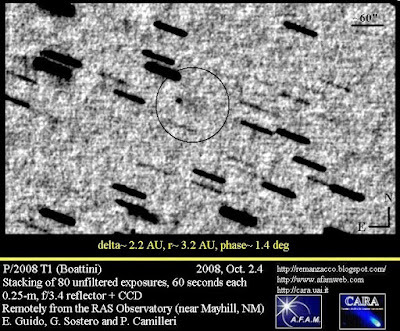 In spite of its very comet-like orbit, in our stackings (total exposure time of 30 minutes) this object appears perfectly stellar, with no hints of any detectable coma or tail within our seeing limit. IAUC nr. 8939, issued on 2008, April 24, announces the recovery of P/1995 J3 = 1994k = 1994 XXVIII (Shoemaker), providing it the new designation P/2008 G2 (SHOEMAKER). 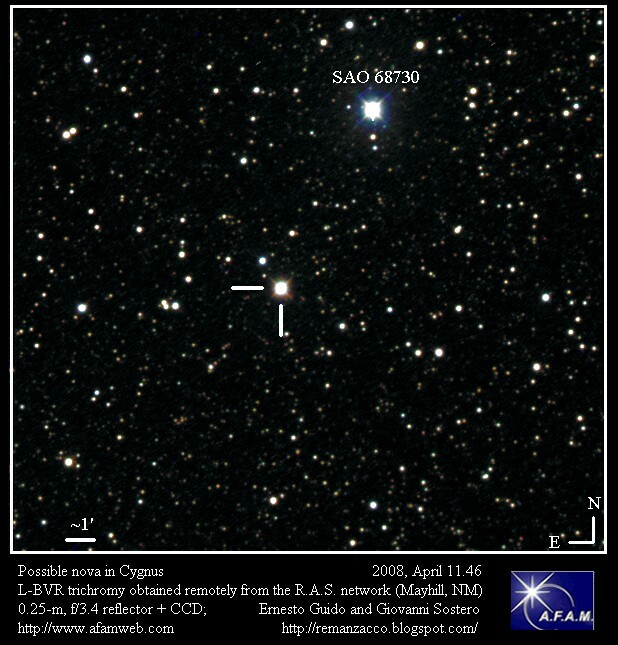 It was picked up by T. Spahr, analyzing the astrometry of Apr. 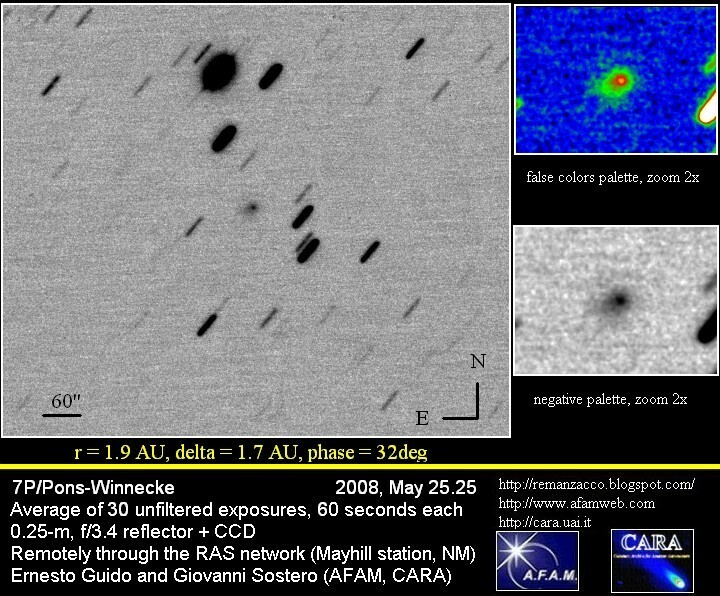 10, reported by the Catalina Sky Survey (observer: R.A. Kowalsky, no comments about any potential cometary appearance) to the Minor Planet Center; linkage to further archive data of Apr.1 was provided by B. G. Marsden. The object was reported as having a magnitude of about 18.6. From our stacking we have evidence of a tiny coma, nearly 10 arcsec in diameter, possibly elongated toward North-West. The measured total magnitude is about 18.5 (R unfiltered). 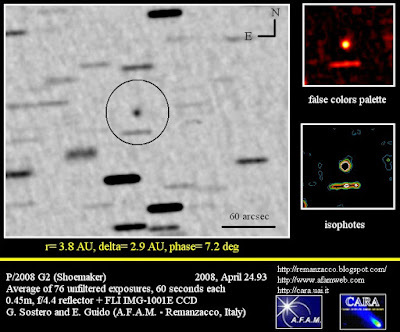 Perihelion of P/2008 G2 (Shoemaker) will occur in April 2009. At that time the comet will have m1 nearly 17. The maximum brightness is expected to be just half a magnitude better, in August 2009, when the comet will mostly be a southern object. CBET No. 1343, issued on April 20th, announces the discovery by the Lincoln Near Earth Asteroid Research team of a 18.th magnitude comet in Ursa Minor officially designated C/2008 H1 (LINEAR). It was picked-up on 2008, Apr. 18.34722 with a 1.0-m, f/2.15 reflector + CCD located in New Mexico (USA). 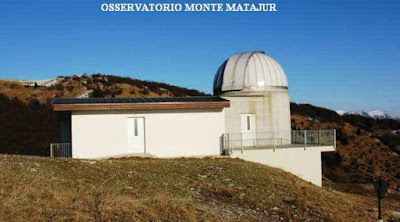 After its posting on the Minor Planet Center's 'NEOCP' webpage, several observers performing its astrometric follow-up, reported about its cometary nature: in particular, E. Reina (April 19.0, Masquefa Observatory, Spain) commented about a magn. 16.6 coma almost 25 arcsec in diameter, and a 43 arcsec tail toward P.A. 233 deg. J. M. Aymami (April 19.8, Observatorio Carmelita, Spain) mentioned a suspected coma elongated toward P.A. 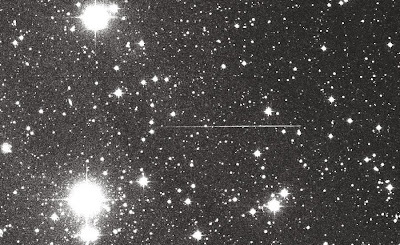 209 deg, while R. Apitzsch (April 19.8, Wildberg, Germany) noticed a tail toward southwest. On April 19.5 we performed our own confirmation images, remotely through a 0.25m, f/3.4 reflector + CCD from the Rent A Scope network (Mayhill station, NM). The sky was clear, however the full Moon increased quite a lot the sky backgound noise; moreover, due to some technical problems, we couldn't stack more than 20 single unfiltered exposures, hampering our detections of very faint details. Anyway, also on our image, below the trail of a faint field's star, it's possible to appreciate the presence of this new comet, with the typical diffuse shape of this kind of objects. A photometric analysis perfomed via Roberto Trabatti's Winafrho software (CARA's dedicated data reduction package), provides m2~ 18 (Ru) for the central condensation, and m1 ~16.5 (Ru) for the total coma brightness. 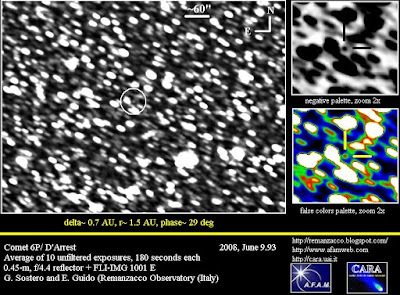 The Afrho parameter (proxy of dust abundance within the coma) upper limit for this comet is then estimated to be nearly 90 +/- 30cm; considering that C/2008 H1 currently is at almost 2.8 A.U from the Sun past perihelium, this result seems to point toward a comet of modest activity. Preliminary orbital elements published by the Minor Planet Center on M.P.E.C. 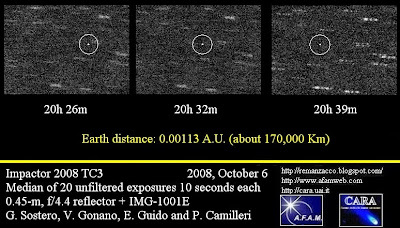 2008-H09 show that this object moves along a very elongated and tilted orbit (e= 1, i= 76 deg); perihelion occured on 2008, March 11, with q~ 2.8 AU. According to the ephemerids, for the next few months this object will remain mainly a northern hemisphere target, and it will decrease its brightness from V~ 16.8 to nearly V~ 18. 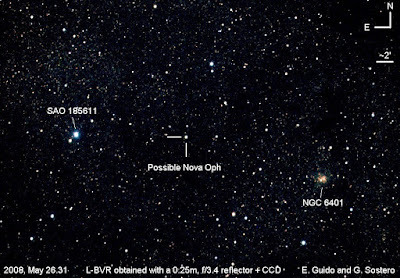 Prompted by an alert note published on the Central Bureau's unconfirmed-objects webpage about a possible nova in Sagittarius, today we performed some follow-up of this object through a 0.25-m, f/3.4 reflector + CCD remotely, near Mayhill (NM). 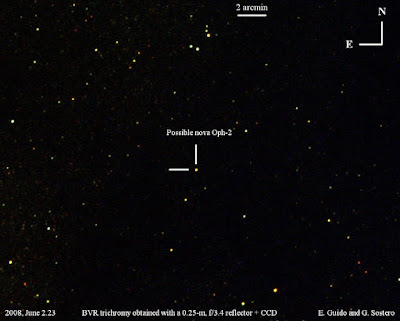 Prompted by an alert note published on the Central Bureau's unconfirmed-objects webpage about a possible nova in Cygnus, today we performed some follow-up of this object through a 0.25-m, f/3.4 reflector + CCD remotely, near Mayhill (NM). 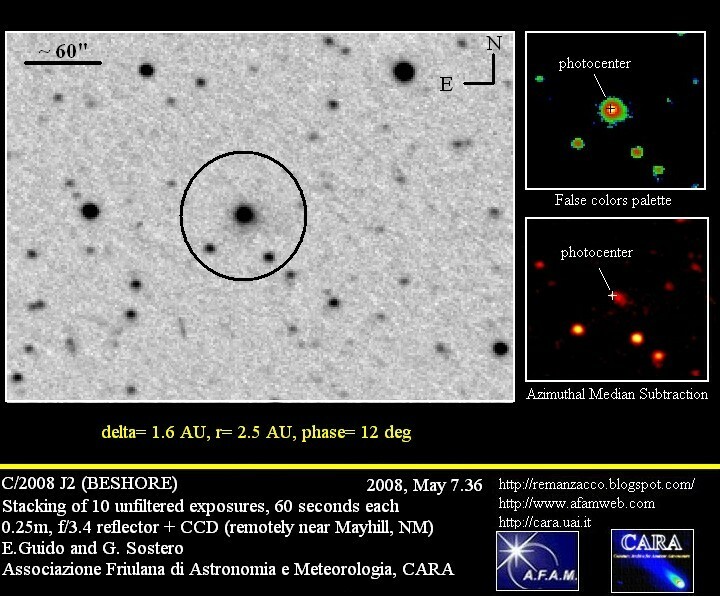 Our multicolor photometry provides the following values: 2008, Apr. 11.36, B= +8.06, V= +7.54, R= +7.04; 2008, Apr. 11.46, B= +8.20, V= +7.77, R= +7.15 (accuracy +/- 0.05 magnitudes in each color). IAUC nr. 8932, issued on 2008, April 9, announces the discovery of a new comet by A. R. Gibbs: C/2008 G1 (GIBBS); it was found through the 1.5-m reflector + CCD of the Mt. 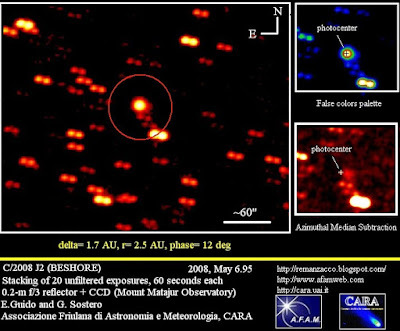 Lemmon Survey on 2008, April 7.36 while it was slowly moving in Serpens. 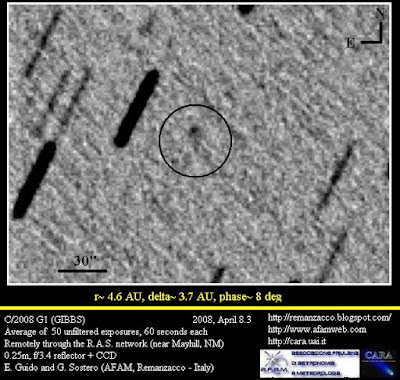 In our stackings from both sites, "8GA7420" showed its cometary nature, with a small coma, some 8 to 10 arcsec in diameter, and a short tail, 15 to 20 arcsec long toward South-SouthWest. The total magnitude m1 has been calculated as R~19.1, while the nuclear magnitude m2 was R~19.5. Preliminary orbital parameters published by the Minor Planet Center show that this comet moves along a parabolic orbit (e=1, i=72 deg, q= 3.7 AU). 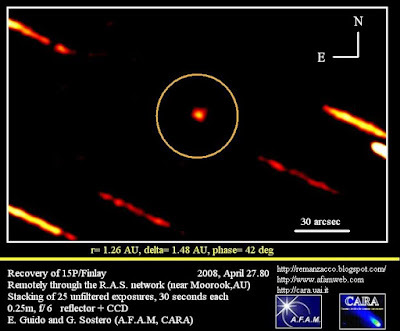 It will reach perihelion on February 2009. This comet will be mostly a northern object, and it's not supposed to get any brighter than magnitude 18. 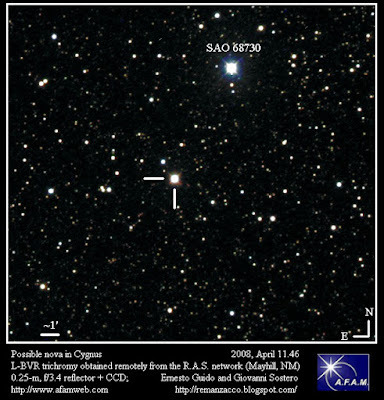 2008 GS3 is Aten-type Near Earth Asteroid that has been discovered by the Lincoln Laboratory ETS Sky Survey (MPC #704) on 2008, April 7.30; we performed its follow-up from the Remanzacco Observatory on 2008, April 7.9, while it was labeled as "BJ81650" in the NEO-CP webpage. At the beginning, it didn't show up in stackings, very likely because of the uncertainty of its ephemerids (the stacking we did was performed according the "best guess" preliminary speed and PA available at the moment). 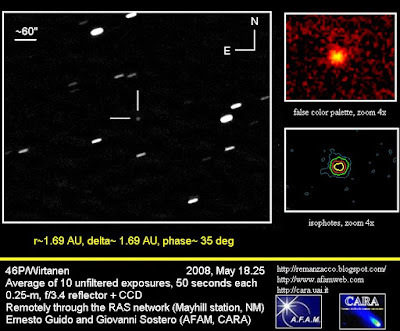 On 2008 April 9.5, the object was still listed in the NEO-CP, but its ephemerids were considerably improved due to the follow-up astrometry produced by several observers. Then we re-stacked our original frames of the 7-8 April night with the new speed and PA, and we find it! According to the preliminary orbital elements available at Minor Planet Center database, 2008 GS3 is a rock with an estimated diameter of nearly 100 meters, orbiting the Sun every 9.5 months. At perihelion it reaches at almost 80 Million Km from our star, between the orbits of Mercury and Venus, while at aphelion it approaches the Earth's orbit. When we imaged it, the asteroid was at 25 Million Km from our planet, moving at nearly 7.3 arcsec/min in Virgo, with a magnitude of nearly R~19. Comet 7P/Pons-Winnecke is currently approaching the Sun, during its journey to the inner Solar System. 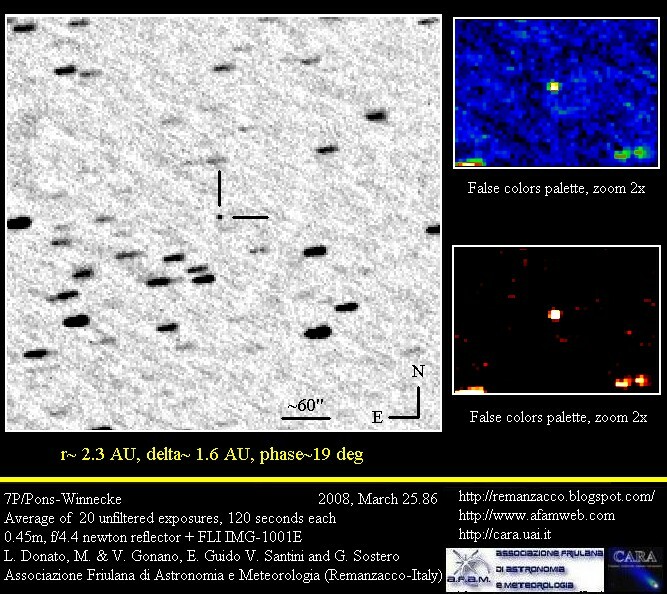 On 2008, March 25.9 we imaged it from the Remanzacco Observatory (Italy): after weeks of bad weather, a storm finally cleared up the sky, so we were able to perform some follow-up of this faint comet, while it was slowing moving in Ursa Major. We performed a preliminary photometric analysis, that returned a magnitude of R~ 19.5; at this low level of activity, the afrho parameter (proxy of the dust abundance within the coma) is dominated by sunlight scattered by the nucleus, so it doesn't have a straightforward interpretation (just for the record, its current value is close to a few cm). 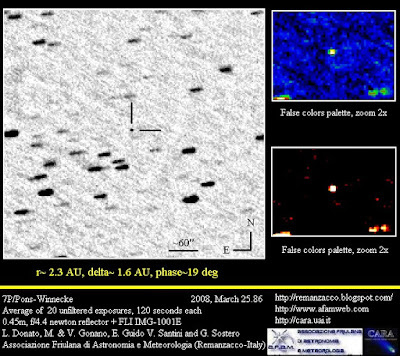 7P/Pons-Winnecke belongs to the Jupiter family cometary class (q~ 1.2 AU, Q~ 5.6 AU, i~ 22 deg, period~ 6.4 years). 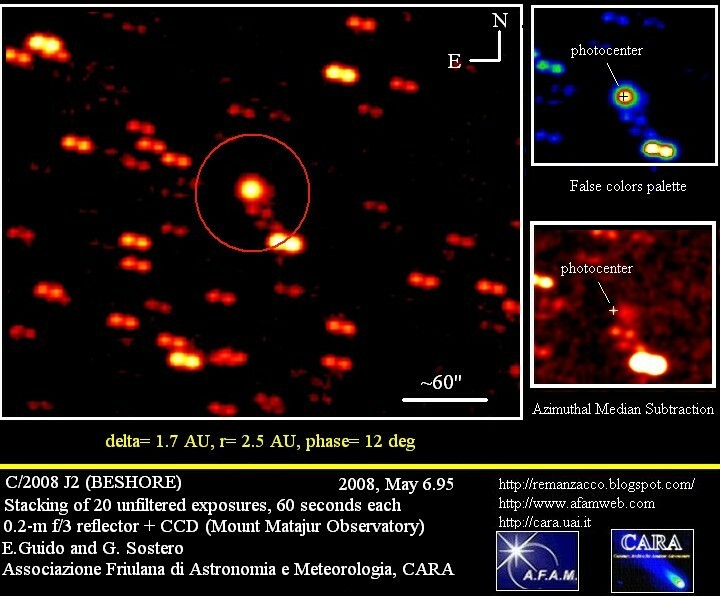 During its current approach, it has been recovered at magn.21 on 2007, Dec. 17 by K. Sarneczky (University of Szeged), 0.60-m Schmidt + CCD. It will reach perihelion at the end of September 2008, and it's not supposed to get any brighter than magnitude 12.5 at its best (but at small solar elongation). C. Snodgrass et Al. [A&A 444, 287-295 (2005)] estimated the nucleus radius at ~2.2 Km, and bracketed its rotation period between 6.8 and 9.5 hours. This comet has been related to the June Bootids meteor stream, that was pretty active during some of the comet's passages in the first quarter of the past century. However the current activity of this meteor shower is rather modest, probably because the gravitation influence of Jupiter changed significantly the orbital path of the comet and its associated meteoroid debris. IAU circular nr. 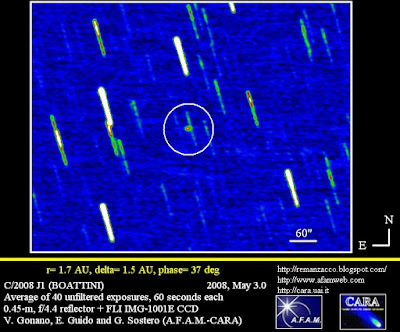 8927 published yesterday, announces the discovery of a new comet by Gordon Garradd, named C/2008 E3 (GARRADD). 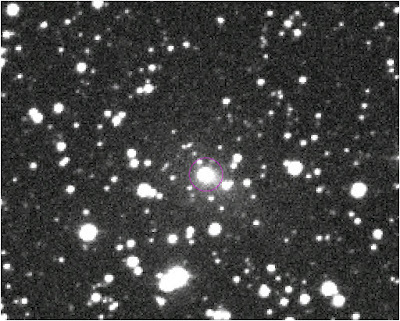 This object has been picked-up on 2008, March 5.8 on images obtained within the Siding Spring 0.5m Uppsala schmidt reflector + CCD. In our stacking we can appreciate a coma nearly 10 arcsec in diameter, with a strong central condensation. Through strong enhancement of the visualization parameters, a faint and extended outer halo nearly 20arcsec in diameter, possibly elongated toward North-West, seems to be visible (however it must be said that in our frames this detail is very close to the background noise, and thus must be considered as uncertain). It's also possible to see a faint and broad tail, extending nearly 20 arcsec toward North. We measured the central condensation as m2 almost 18.4, while the 10 arcsec coma has an m1 nearly 17.7 (both are unfiltered CCD magnitudes, approximated to R). A preliminary afrho (proxy of dust abundance within the coma) measurement provides a value close to 450 +/- 100 cm; this seems to point toward a pretty active comet, considered that it's current distance from the Sun is r~ 5.5 AU. The Minor Planet Center database points to a (preliminary) retrograde parabolic orbital solution with an inclination on the ecliptic plane of i~ 107 degrees; perihelion will be reached at the end of next October, at 5.2 AU from the Sun. 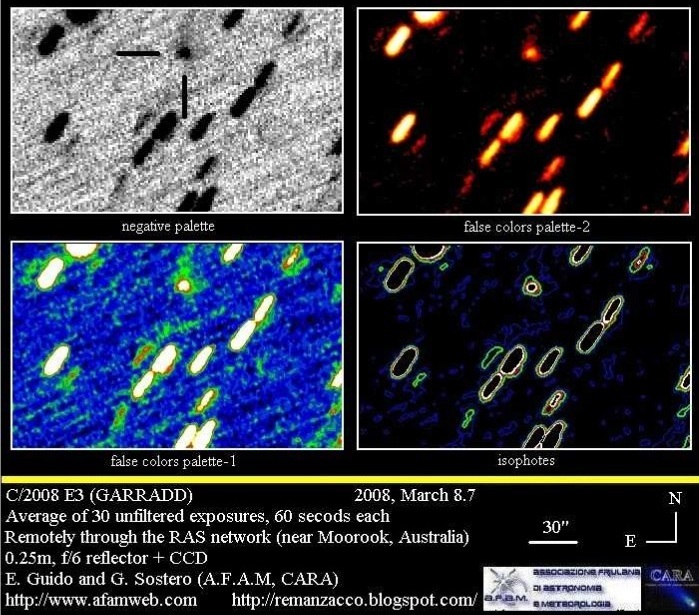 C/2008 E3 (GARRADD) will remain a southern hemisphere object, and it's not supposed to get significantly brighter than magnitude 17.